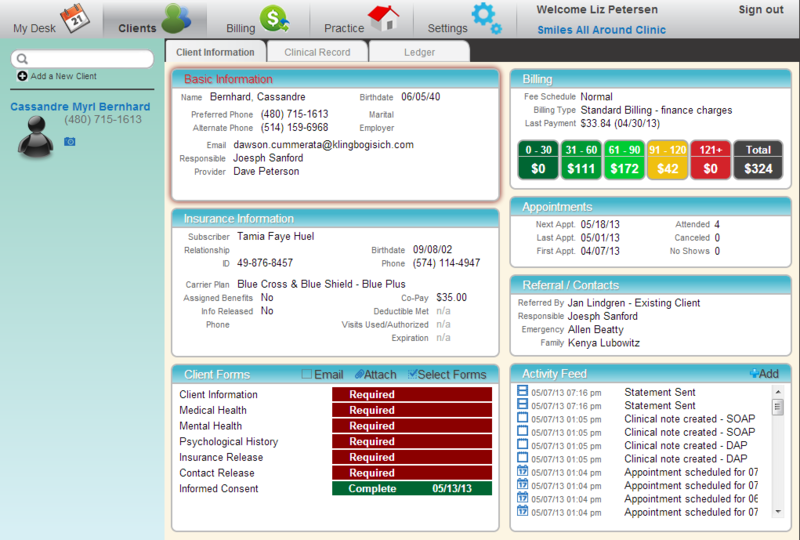 Finally, practice management software for sole therapists or a clinic. 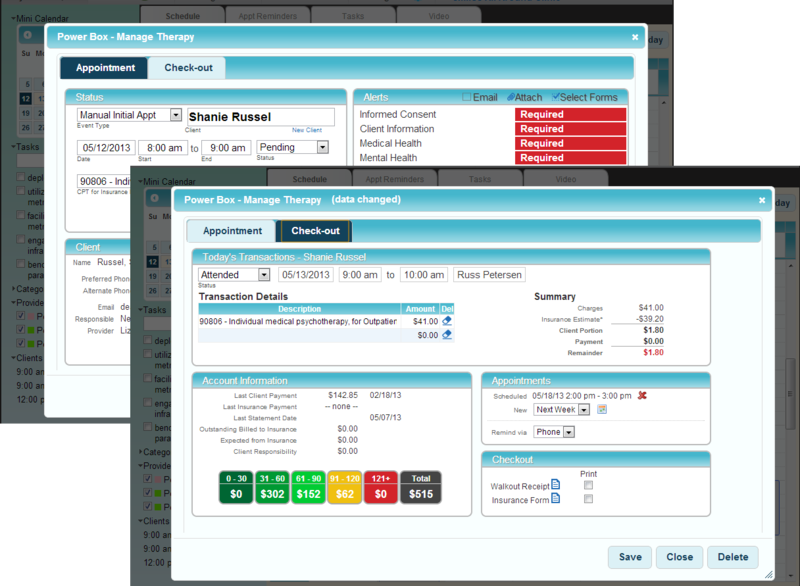 Dashboard interface for at-a-glance overviews of your schedule, client profiles, clinical records, and billing & accounting. Choose your note format – SOAP, SAP, SIP, or simple free form. 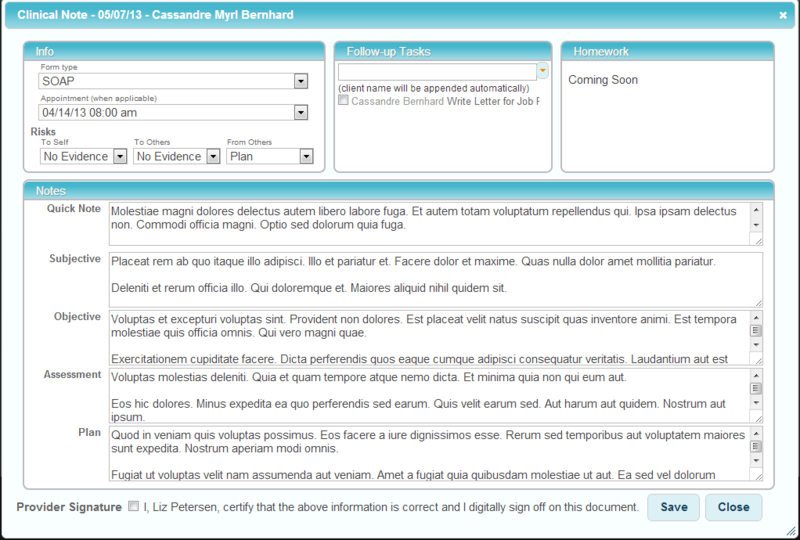 Add tasks and assign homework. Notes are automatically saved every 5 minutes so you won’t lose your hard work if your browser freezes. Every change to signed notes are archived to PDF files so you have a complete client record and audit trail. Offer and conduct video sessions with confidence. The video module is encrypted and secure so it meets HIPAA rules. Video sessions appear on your schedule like all other appointments. Notes are integrated and billing and insurance information is captured for submission with all your in-office appointments. 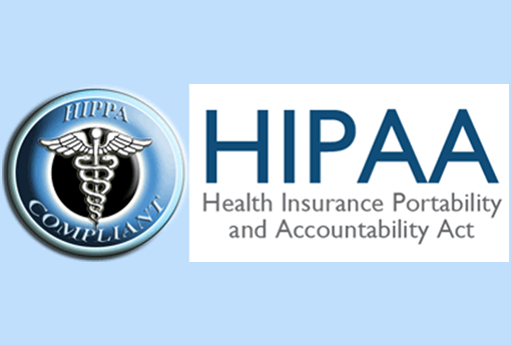 Our software is fully HIPAA compliant, including video. Stay focused and on task with the powerful MyDesk scheduling dashboard that lets you view one or all provider’s schedule for a day, week, or month with one click. Add or complete tasks too. Appointment check-in and check-out is simple with our uniquely smart PowerBox. Enter new or update clients or insurance. See what forms the client needs to complete. Today’s charge is entered automatically. Make their next appointment. Generate the walkout receipt and a HCFA form for today’s appointment. 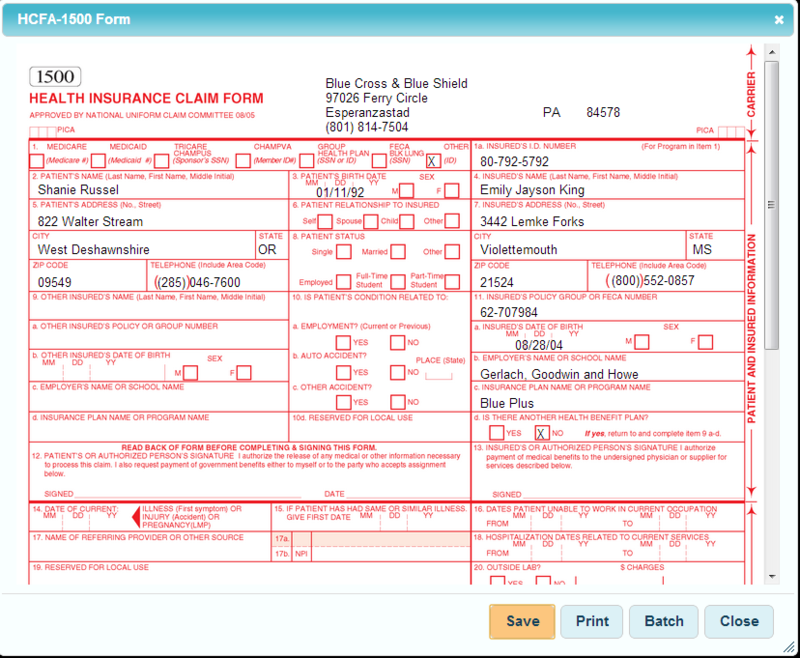 Print a HCFA form during check-out for your client to submit to their insurance company. The form will be pre-filled as much as possible and all fields are available to be filled in or changed. Each appointment’s last HCFA form can be reprinted. 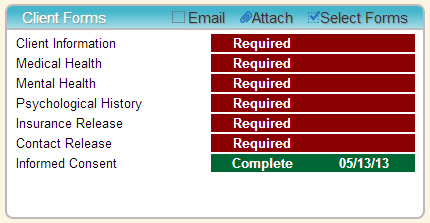 Easily see of this client’s required forms and whether they have been completed. You can select additional forms this client should complete and email an invitation for them to complete them through the Client Portal. Forms can be required for everyone by default or just for client’s you choose. Some standard forms are built in, but you can customize the text or remove them from the system. Create your own custom forms that client’s must sign as part of your practice. You can even upload other image files for the client to review through the Client Portal. Once a client is entered into the system, you can invite them to use the portal where they can review and fill out forms before they get to the office. 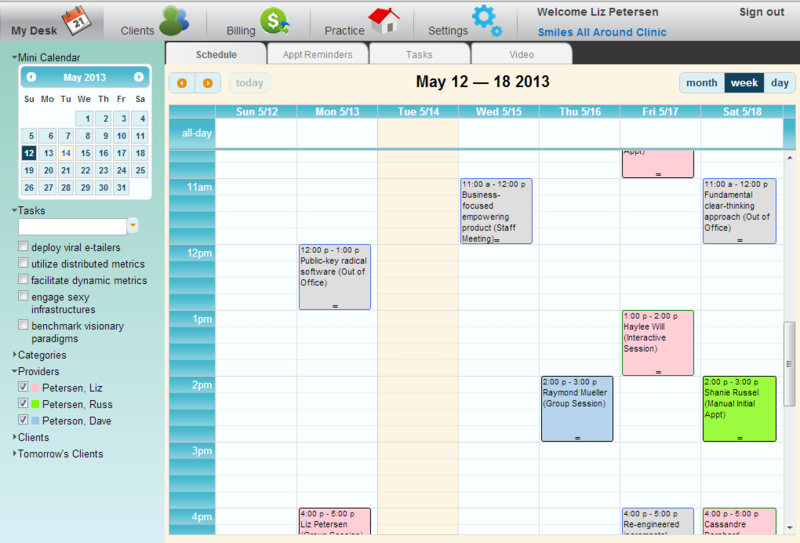 Clients can see their upcoming appointments and homework too. Account Aging is a visual summary of a client’s outstanding balance status. You will see it in several places in the system to help you make decisions about reminders and payments collection. Submit claims directly to insurance companies. Electronic submissions are more accurate and complete so they are usually paid quicker with less rejections. The system keeps track of authorized visits and how many are used and remain. It even helps remind you when it’s time to authorize more visits. Then sends the authorization electronically. Verify a client’s insurance eligibility so there are no surprises and unpaid accounts. While our system is sized just right for an ipad right now, we’re developing native ipad, iphone, and android apps so you can review your schedule, check tasks, and more from anywhere. Some tasks can be automatically entered for you. For instance, whenever an appointment is set as “Attended” a task will automatically be added to create a clinical note. That task will now show up in your task list. Some forms like Treatment Plan can “predict” the provider’s choices to speed up data entry. For example, if a provider sets up a Homework task to read a specific book whenever a diagnosis of mild depression is entered, that homework task will automatically be filled in. Of course, the provider can override any choice at any time. Custom client surveys can be created and required by certain clients to be completed at specified intervals. Surveys will be available as part of the Client Portal too. The system will help keep track of any court requirements and status for court ordered clients.